Listen to KVOE (104.9, 101.7 FM, and 1400 AM) the Wave (96.1 FM) or Kiss (103.1 FM). Watch WIBW (ch 13), KSNT (ch 27), and KMAJ (43). Look online at www.weather.com and type in your zip code. 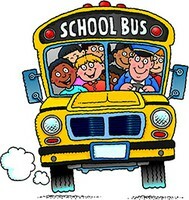 You can call the Transportation office at 620-341-2219 for school information. Rain/flood – If you live in the country keep an eye out to see if low water bridges are still passable or not. Call the Transportation office to report water over bridges and to see if the bus will be able to get to your house or not. Remember that the buses do not travel over water. Snow/ice – Dress appropriately for the weather. You never know when your bus could be late due to the weather. Stay back from the road. If the roads are icy the bus could move toward the curb even right before it comes to a complete stop. Tornado – The bus is a very bad place to be during a tornado. When it is time to board the bus, do not get on if tornado sirens are going off. Go to an interior room or basement of a building or lie low in a ditch if there is no shelter you can get to.